The Giants made it to the Super Bowl thanks primarily to its defense, headlined by Hall of Fame linebacker Lawrence Taylor (arguably the greatest defensive player in NFL history), Pro Bowl DE Leonard Marshall and LB Carl Banks, and cornerback Everson Walls, who is a finalist for the 2018 Hall of Fame class. New York led the NFL in fewest points allowed that season. Their offense could put up points, but went into the Super Bowl led by backup QB Jeff Hostetler, who had taken over when starting QB Phil Simms suffered a late-season injury. Now look at Super Bowl 52. The Patriots are heavily favored, boasting an offense that was ranked No. 1 in the league in totals yards and No. 2 in points scored during the regular season. Hall of Fame QB Tom Brady, arguably the greatest of all-time at his position, leads the charge. His top target is tight end Rob Gronkowski, also in the discussion for GOAT status at his position. (Head coach Bill Belichick is also a strong GOAT candidate among coaches.) Patriots fullback James Devlin was voted to this year’s Pro Bowl. New England’s defense is good — ranked No. 5 in the NFL in fewest points allowed — but its star-studded offense is the team’s biggest strength. The underdog Eagles have thrived with a great defense that ranked fourth in the league in fewest points and fewest yards allowed during the regular season. Philadelphia held its NFC playoff opponents (Atlanta and Minnesota) to a combined 17 points in two games. Defensive tackle Fletcher Cox and strong safety Malcolm Jenkins were voted to this year’s Pro Bowl, while DE Brandon Graham was named All-Pro last season. The Eagles’ offense is good, but they go into the Super Bowl led by backup QB Nick Foles, who took over when starting QB Carson Wentz suffered a late-season injury. As usual in this pass-heavy NFL era, the defensive backfields of each team will be under fire, their play-making ability possibly making the difference between New England winning its sixth Super Bowl and Philadelphia winning its first. Here is a rundown of the secondary units for the AFC champion Patriots and NFC champion Eagles. Inconsistency has been a consistent theme for the Patriots’ secondary. Butler and Gilmore in particular have been under a microscope for their up-and-down performances; Butler is in a contract year, while Gilmore is in Year 1 of a five-year, $65 million contract. In typical fashion for this franchise, however, the secondary appears to have pulled things together just in time when it matters most. Butler was an All-Pro selection last season while Gilmore made the Pro Bowl (playing for Buffalo). McCourty was both a Pro Bowler and an All-Pro pick in 2016. None of New England’s defenders received those honors this season, but the secondary has done a good enough job of bending without breaking to put the team on the brink of another championship. The best thing the Patriots’ secondary has going for itself at this point is experience. McCourty and Chung will be playing in their fourth Super Bowls with New England and aiming for their third championships, respectively. Butler and backup safety Harmon are going for their third title rings in three appearances. Butler made himself famous as a rookie when his goal-line interception clinched New England’s Super Bowl victory over the Seattle Seahawks. Gilmore made his postseason debut this year after coming over from the Bills. He is the most talented of New England’s DBs, a four-star recruit in high school and a top-10 pick in the 2012 NFL Draft. Gilmore was one of the heroes of this past Sunday’s AFC title game win over the Jacksonville Jaguars. Late in the fourth quarter, the Patriots were clinging to a four-point lead, and Jacksonville was driving. On fourth down, Jags QB Blake Bortles lofted a pass for WR Dede Westbrook that would’ve been a first down and perhaps a touchdown. Westbrook had Gilmore beat, but Gilmore made a diving, fully-extended deflection to end the drive and clinch the Patriots’ trip to the Super Bowl. McCourty was New England’s leading tackler this season with 97 stops. Butler forced a team-high three fumbles, while Harmon led the team with four interceptions. On paper, the Patriots secondary hasn’t been tested as much in these playoffs by the Jaguars and Tennessee Titans, offenses that rely more on the run (and had to play in the cold New England weather). But the Eagles have a Pro Bowl tight end in Zach Ertz and a former Pro Bowl receiver in Alshon Jeffery. Foles has posted a passer rating over 100 in three of his five starts (including the playoffs); he threw for four touchdowns in his first start against the Giants, and three touchdowns to go with 352 yards in the NFC title game against Minnesota’s top-ranked defense. As well as their backup quarterback has been playing, the Eagles are still rolling into the biggest game of the year with their backup quarterback. That’s never an ideal situation. And while the offense has been productive, the running game hasn’t been great or consistent. Which means it’s even more crucial for Philadelphia’s defensive backs (nicknamed “Gang Green”) to show up and make some big plays to keep the Patriots offense from blowing up on them in Super Bowl LII. As a group, they’ve come a long way. During training camp, Mills (a 7th-round draft pick in 2016) and Robinson were reportedly in danger of being cut. Rookie cornerback Sidney Jones was still sidelined by a torn Achilles he suffered during pre-draft workouts. The Eagles traded for Darby (from Buffalo), but then he got injured in his first game and was out of action for several weeks. Things were not looking good for the Eagles secondary, but they’ve since turned into one of the league’s best. The leader of the unit — and the emotional leader of the entire team — is Jenkins, a two-time Pro Bowler who won a Super Bowl title with the New Orleans Saints in 2010. Jenkins may be more known to the mainstream football fan base for his raised-fist protests during the national anthem. But to those who follow the game more closely, he is renowned for his hard hits and proverbial “nose for the ball”; Jenkins always seems to be where the action is on every snap. Jenkins recorded 76 tackles this season to go with two interceptions, a forced fumble and a fumble recovery. The most talented of the group might be Darby, a rookie sensation with the Bills in 2015. After being sidelined for half the season, he made a smooth transition back into the lineup once he got healthy and recorded three interceptions. 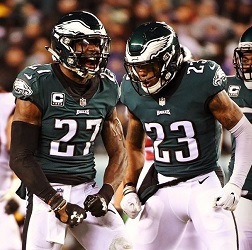 McLeod and Mills also had three interceptions apiece during the season — Philly tied for fourth in the league with 19 picks as a team — while backup safety Graham and backup corner Douglas each had two INTs. Robinson, who stepped into the starting lineup when Darby was hurt, led the Eagles with four interceptions and 18 pass breakups. In the NFC title game win over the Vikings, Robinson had a 50-yard touchdown on an interception return. Oh, and about Super Bowl 25 back in ’91: The Giants ran the ball effectively, controlled the clock, didn’t commit any turnovers, kept Kelly and the Bills’ passing game out of the end zone, and won in a 20-19 upset.